Montaño and Cañizares at the Baluarte Theater in Pamplona with the Navarra Symphony Orchestra | José Antonio Montaño, Orchestra Conductor José Antonio Montaño, conductor. After having conducted the world premiere of the Ballet El laboratorio del Dr.Fausto (a production by the Teatro Real of Madrid), Maestro José Antonio Montaño returns to the Baluarte Theater in Pamplona, accompanied by the Navarra Symphony Orchestra. 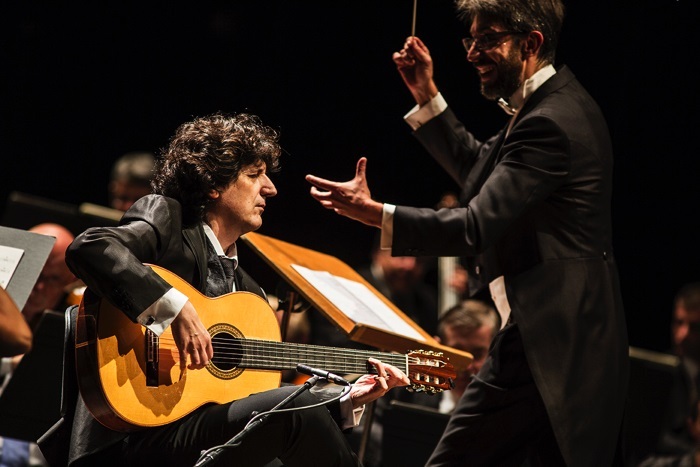 On this occasion, the public will enjoy a symphonic concert which features the work: Al Andalus Flamenco Concierto for Guitar and Orchestra by Juan Manuel Cañizares, where the composer himself shall perform the solo part of his work. The program will be completed with works by Manuel de Falla, and will take place on August 22nd 2017, as part of the programming of the Festival Flamenco in Pamplona. This is to be one of many performances of this Concert by both artists. Other dates for the concerts are Thursday, 31 August and Sunday, 3 September 2017, in Italy, where the artists shall perform Al-Andalus again, and are on this occasion accompanied by l’Orchestra Sinfonica di Milano LA VERDI.